Talk about a fast turnaround. This brand was the product of a one-day speed re-branding and website workshop for Relocating in Columbia, a magazine which provides resources, welcome, and “inside scoop” info on schools, neighborhoods, recreation, etc. for anyone relocating to the lovely Columbia, MO. In 6 hours we (at Hoot Design Co.) put together all brand elements for Relocating in Columbia as well as their website skeleton and a full educational session on how to use and edit their new website. On this project, I was responsible for blowing out the full brand as well as implementing it across the new website. 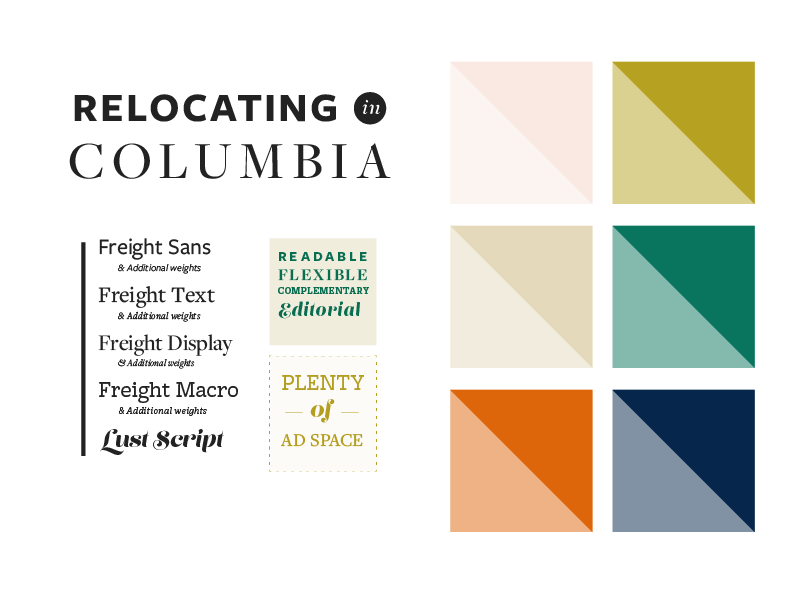 Note: The revamped Relocating in Columbia site is still being fleshed out with content (and may never actually go live, unfortunately). I *definitely* did not create the website that is currently live.